For most of my life, I have always thought that I have been in good shape. I was a swimmer throughout high school and college. I spent countless hours staring at the line at the bottom of the swimming pool. When I ‘retired’ from swimming in March 2010, I absolutely loathed the thought of exercise. I hated running. I am embarrassingly uncoordinated, and I cannot play team sports. So I decided that I was just going to stop exercising completely… That didn’t work out so well for me. By the time I graduated from college in May 2012, I was weighing in around 190 pounds and a size 14. What had I done to myself?! Something had to change. I spent the following summer killing myself on a treadmill and attending group exercise classes at my local YMCA. I slowly saw some progress, but it was minimal. As I prepared to move my life from Pennsylvania to Texas in August 2012, I started to research gyms in the area. 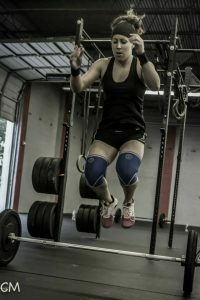 I came across Crossfit Beaumont during one of my Google searches; I had never heard of crossfit before. I looked around the website, read the testimonials, and saw that there were free classes on Saturdays. I figured that I had nothing to lose – it was free and I never had to go back if I didn’t like it. So I went on a Saturday, and I was hooked! Weeks turned into months, and the results were dramatic! I remember being amazed by the women doing unassisted pull-ups, squatting heavy weight, and doing the olympic lifts. I wanted to be like them. I’ll never forget the day that Kara took me out to the grass behind the old gym and tried to teach me handstands – I was awful. As time went by, I started to decrease the pull-up bands that I used. I could do a few push-ups from my toes. I was squatting more weight than I ever though possible. It was amazing! Then, Neal told me that I should sign up for a scaled competition in Houston. I thought he was crazy! I had just learned how to do kipping pull-ups and had only been doing Crossfit for a few months. But I signed up, competed, and actually won the scaled division! The feeling was incredible. I had finally found a passion in a new sport. Since then I have competed in numerous Crossfit competitions all over Texas, never placing lower than the top 5. Competing in Crossfit has filled the void that swimming left behind. I completed my Level 1 Trainer Certification last summer so that I could spread my passion for Crossfit to others. Crossfit has given me more than I could ever have imagined. I am in the best shape of my life; I now weigh 150 pounds and wear a size 4. I am constantly proving to myself that I can push myself harder and farther than I previously thought. Crossfit has given me not only incredible fitness, but it has also given me incredible friends and a supportive community. CFB and CFMC have made Texas feel like home, and I wouldn’t want to be anywhere else. Thank you Neal, Kara, all the coaches at CFB and CFMC, and all the members for being so motivating, encouraging, and inspiring. I wouldn’t be where I am today if it weren’t for your knowledge and support!